A wide variety of internships, bursaries and fellowships are open to enable MFT nurses, midwives and allied health professionals to study for postgraduate research degrees, either full time or part time. In particular, the National Institute for Health Research (NIHR) fund prestigious MRes, PhD and post-doctoral bursaries and fellowships which cover full employment and other costs. An idea of the breadth of opportunities and support available can be seen in the diagram below. 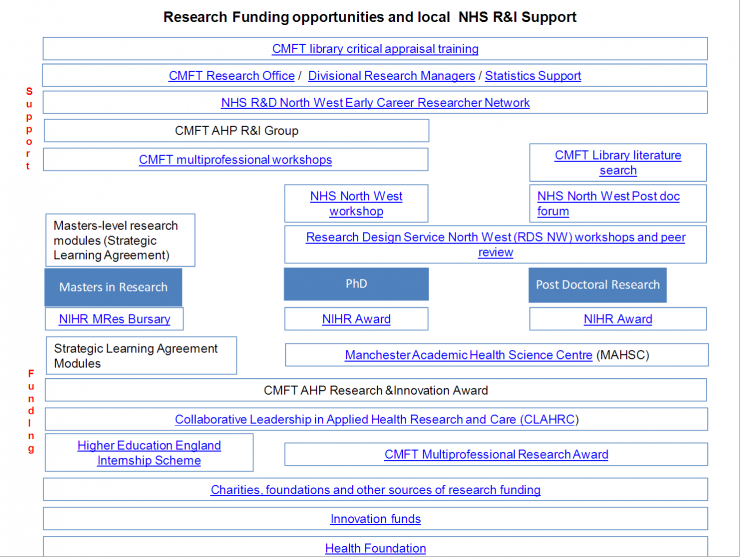 The University of Manchester and MFT have a good history of supporting and supervising successful applicants for the NIHR awards and as such, if you are thinking of applying, we strongly recommend that you contact Tim Twelvetree or one of the other MFT multiprofessional research team first. Lecture series showcasing the leading clinical nursing research and evidence to promote quality care and safe practice. The Research Office is responsible for the operation of systems to ensure that research across CMFT conforms to all necessary legal, regulatory and ethical requirements. Divisional Research Managers coordinate and support research activity and represent and report to both the Research and Innovation Division and Clinical Division.